A new collection of essays and stories by John Gierach will be released from Simon & Schuster on April 15th. All Fishermen are Liars is Gierach’s seventeenth book and ranges in topic from his own childhood to tinkering with Tenkara. You can watch a video related to the new release here. John Gierach, “America’s best fishing writer” (Houston Chronicle), delivers essays that are everything from mischievous to eloquent, addictive to elegiac, witty, and irreverent. 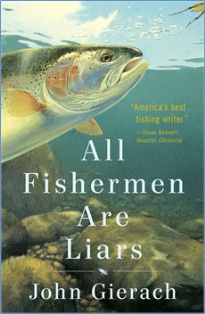 His masterful ability to evoke a variety of emotions is on full display in his seventeenth book, ALL FISHERMEN ARE LIARS (Simon & Schuster; April 15, 2014; $24.00), a collection of twenty-two essays on the art of fly-fishing and the pleasures of outdoor life, all served up with Gierach’s trademark humor and clear-sighted wisdom about the lessons that can be learned while standing in a river with a fishing rod. ALL FISHERMEN ARE LIARS follows Gierach on trips across North America, from the Pacific Northwest to Wisconsin, from Alaska to Labrador. Sometimes he fishes familiar streams in his home state of Colorado, where he knows the back roads to the best fishing spots. And sometimes he travels by boat, floatplane, and more often than not, on foot in waders, to fish in the company of trusted friends, fellow enthusiasts, and knowledgeable guides who are all in search of the best catch. When some of the fish get away, Gierach never loses his passion for the sport, his sense of humor, or his appreciation for his incredible luck that he gets to go fishing (and write about it) for a living. A Day at The Office: An autobiographical essay following Gierach from his childhood in the 1950s when “kids are still allowed to run wild as long as they’re home by dark” (2). It is in these years of hand-me-down fishing rods and innocent trespassing on private streams that John’s passion for fly-fishing develops. As he grows older, some things come and go – women, money, a roof over his head – but Gierach never gives up on fishing, and eventually finds a way to make a living doing what he loves: fishing and writing. Gierach writes, “And even on those rare days when you trudge off to a trout stream not so much because you want to, but because your livelihood depends on it, you have a better day at the office than most” (11). This Year’s Fly: Gierach embarks on a fishing trip with some old buddies to try out “this year’s fly” — a Morgan’s Midge. In this essay, Gierach outwits a fly shop guy who tells the group, “there’s no reason to be on the river before ten-thirty,” which is “such an old and obvious trick,” that the group makes sure to get on the water by nine-thirty (46). Gierach does some further outsmarting in this essay—this time of the fly itself—as his luck on the river dwindles and he gradually trims and cuts his Morgan’s Midge fly until it’s just “the trailing husk, some thread, and that little foam button” (50). But the simple, dressed-down fly works, and he has a nice haul before heading home. Gierach does not obsess over precision or maintaining his fly. He just does what is necessary to catch the fish. New Water: A lyrical essay in which Gierach investigates a Wyoming stream he has spotted countless times over the years from his car window, but always on the way elsewhere. He finally fishes the stream, catches a few fish, but is changed by the experience of fishing a stream he’s never stood in before. He writes, “There were no surprises, but somehow everything was a surprise: how the trout fit the water the way birds fit the air and how they’re so hard to spot in the stream, but so ornately beautiful in the hand. I know their coloration is a practical matter of camouflage with a seasonal nod to mating, but there seems to be something else in operation here: something frisky that has made these fish prettier than they’d have to be just to get by. It’s fishing new water that lets me see all this again as if for the first time” (60). Tenkara: Gierach experiments with and offers a lesson in Tenkara, a traditional 8th century Japanese method of fly-fishing that uses only a light rod and a length of line attached with a single fly. No guides, no extra line, no reel. He calls it “the soul of simplicity: the fly-fishing equivalent of haiku” (118). Fishing tenkara, Gierach says, is a useful experiment in asking yourself not “How much do I need? But, How little can I get away with?” But in the tradition of classic Gierach, he ends with, “There’s the obvious paradox that in the ongoing search for a kind of blissful simplicity, I’ve gone and gotten myself yet another fly rod” (126). The essays in ALL FISHERMEN ARE LIARS expertly blend the technical side of fly-fishing —such as tying the perfect steelhead fly or casting across a river into the right sweet spot—with contemplative meditations that are brimming with wit, wisdom, and quiet but penetrating insights into nature, travel, and the wonder of life. Readers who fish and fisherman who read will find ALL FISHERMEN ARE LIARS as edifying as it is entertaining, and, as always, the next best thing to fishing itself. John Gierach is the author of several previous books, including Fool’s Paradise, Still Life with Brook Trout, and At the Grave of the Unknown Fisherman. His work has appeared in Gray’s Sporting Journal, Field & Stream, and Fly Rod & Reel. He lives in Lyons, Colorado.